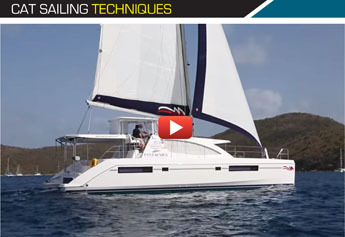 Sailing a cruising catamaran to windward in a choppy sea is not my idea of fun but Seawind’s new 1190 Sport with daggerboards might change that view, writes KEVIN GREEN. The result is a stretched and performance version of the popular 1160 Lite – that was created by shedding internal weight and heavy diesel engines; saving 750kg. 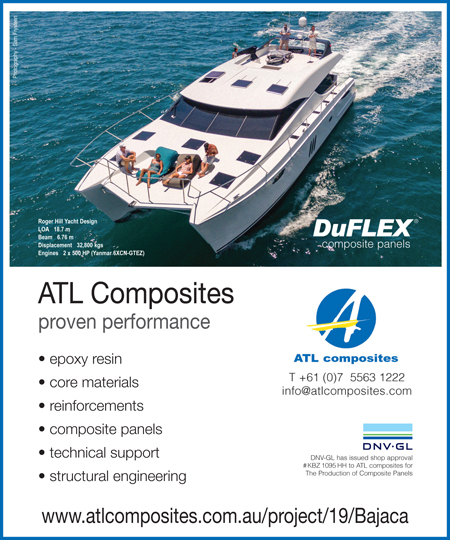 For cruisers the advantage of increased waterline usually translates to better daily mileages while the daggerboards greatly improve stability and upwind performance (compared with mini keels used on all other Seawinds). For adventurous sailors it can also mean beaching in top spots like Lizard Island in Queensland – a Mecca for Top End voyagers awaiting prevailing winds to whisk them around northern Australia. 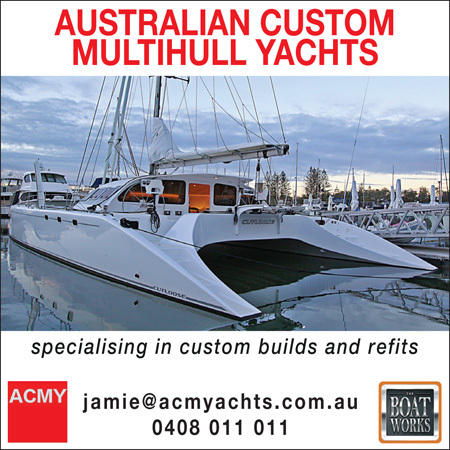 This redesign was not taken lightly by the company, so experienced Australian performance catamaran builder Alan Carwardine was asked to collaborate, along with French naval architect Francois Perus (who worked with Corsair trimarans). 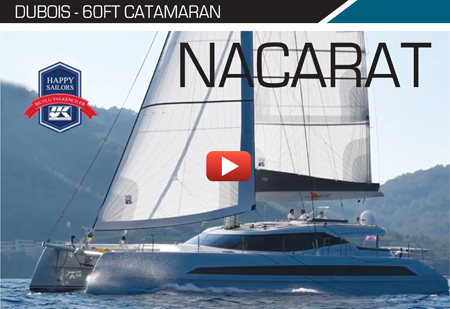 Having raced several of Carwardine’s boats, including the Stealth model in the last Multihull Championships in Phuket, I’ve been duly impressed with his designs. Installing a daggerboard housing into the GRP resin-infused hulls does use some internal space, such as blocking one external window in the galley, but it’s a reasonable price to pay for better performance. 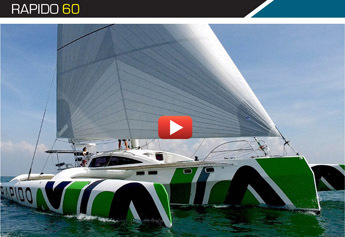 Even better is how Seawind’s design team has incorporated the daggers into the high topsides without any protrusions. Other performance features of this new 1190 Sport include replacing the alloy main crossbeam with a stiffer carbon spar – using the lightweight construction expertise from sister company Corsair. 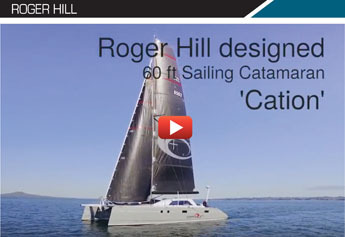 The sail wardrobe is also beefed up in the Sport with a carbon bow sprit added to fly big headsails and a 15% larger mainsail; made of aramid carbon cruise laminate by Doyle Sails. A taller alloy mast has been used and to reduce weight aloft dyneema standing rigging incorporated. The sailplan reflects both the performance and cruising aspects of this boat so, like all Seawinds it has most lines running to the cockpit, except for for some halyards (for quick sail changes during racing which also requires a winch on the mast). 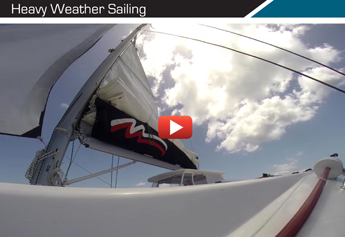 Our review boat came with a roller furling jib that ran on a self-tacking track while the fully battened Doyle aramid mainsail was supported by lazy jacks. It worked effectively on Sydney harbour and for lighter airs a genoa could be added plus a cruising asymmetric/screecher for regattas. Another addition that made halyard hoists easy was the electric Lewmar winch by the port helm but with only outboards for charging I’d be inclined to use muscle instead. 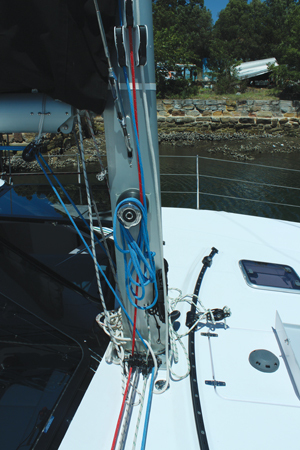 It also doubled as the mainsheet winch and easily controlled the big-topped mainsail while the mainsheet track sits on the bimini with a newly upgraded winch (instead of the less powerful rope winch use previously). Looking at the aesthetics, as I made my way down the pontoon at Multihull Central’s marina at Rozelle, showed the 1190 Sports topside profile to be a wee bit smoother than other models; showing how the moulds were effectively tweaked for this boat. 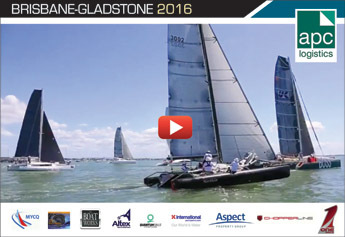 There’s a stylish and sturdier carbon/GRP laminated black targa to hold Seawind’s traditional mainsheet track. 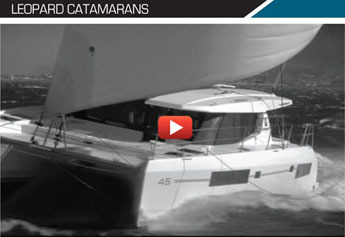 This targa closely adjoins the full length GRP bimini to weatherproof the aft cockpit. Elsewhere in the aft cockpit there’s twin helms, which are my preference for close-quarter handling and racing catamarans. At the main port binnacle there’s B&G instrumentation and autopilot, including the swing-out plotter from the removable saloon window, plus throttles for the twin outboard engines. The starboard binnacle included a single B&G readout with compass; so all good. Stylish touches are the composite steering wheels which give the steerer a chunky grip (compared with Seawind’s traditional metal ones). Storage for the removable saloon windows in slots is a useful yet simple improvement on this model. 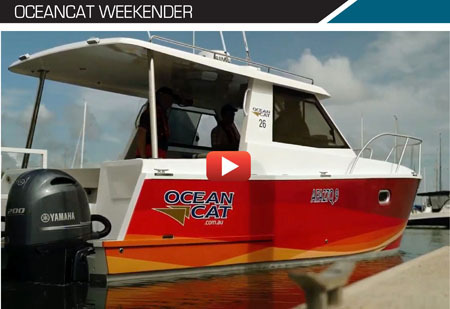 Outboard engines may not be every cruising owner’s choice but having used them on a variety of catamarans, there’s a lot of merit in the modern long shaft four stroke models, that have alternators incorporated. 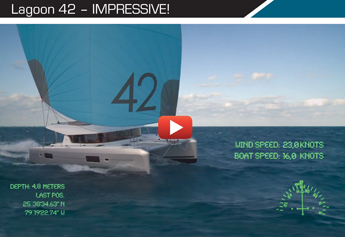 Other advantages (over the standard saildrives) are a huge reduction in drag since the outboards are electrically tilted up when sailing. 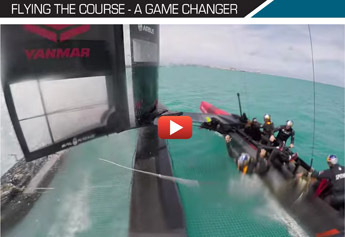 Using them also reduces outboard weight which helps the bane of many cats in choppy seas – hobbyhorsing. This jarring motion can throw many a salty seadog off his legs. Our review boat (hull #4) had the upgraded Yamaha 25hp’s (instead of the standard Honda 20hp’s). 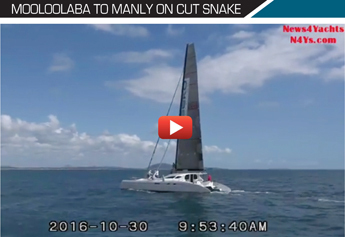 The new Sydney owner chose the Yamaha for its higher thrust. The motors are fed from a single (270L) petrol tank in the forward nacelle. 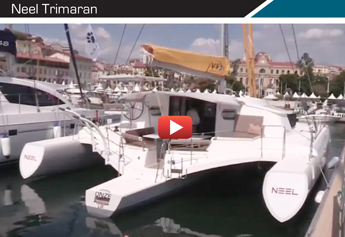 Power supply is the downside of outboards but the acres of space on a catamaran allows ample solar panels, so the 1190 Sport comes with two panels as standard and our review boat had four. They go on the cockpit roof which has been enlarged to hold four 200W panels (with two 125W as standard). In addition the large forward locker can easily accommodate a portable generator but I’d probably add a third house battery as well. 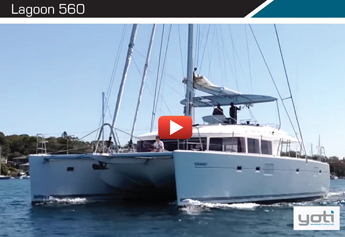 Deck space is what catamarans are all about and Seawind has evolved a very usable layout with the 1190 Sport that frees the aft deck for multiple uses – throw some foldable furniture there or leave it as a social area while the wide transom bench houses the optional barbecue plus davits for the rubber ducky. 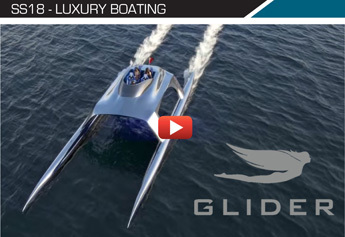 It’s a functional layout and moulded steps in both hulls make water entry easy. 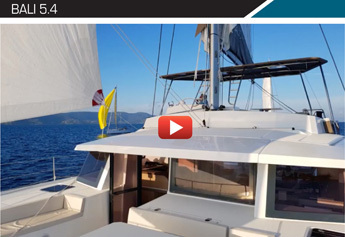 Along the decks the way forward is well supported by the saloon top which brings you to the trampoline where the anchor setup has the horizontal Lewmar capstan/windlass and rode running in a channel to the 45lb Delta bow anchor. 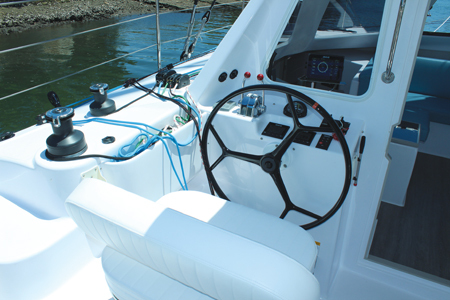 Cleats are located all round, including midships, which finishes off an effective deck layout. Stepping inside, the new Lite interior is strikingly different from the wood-centric interior of previous boats thanks to rounded GRP bulkheads, laminated surfaces and grey stained timbers. The height adjustable dinette table and storage under the benches are functional – and hold the batteries as well (2x 130amp house plus 1 x 130amp engine AGM batteries). 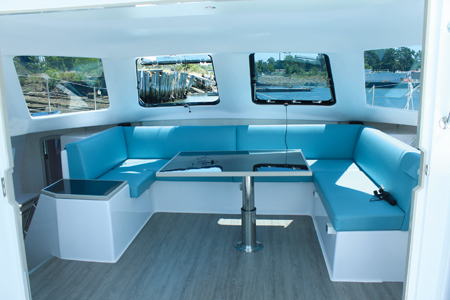 Lounge seating covers the front of the saloon while the adjustable carbon clad table also swivels. Lighter laminated timber with more neutral colours has been used and the upholstery has a more angular design but with hard-wearing Sunbrella fabrics. The navigation station is down in the port hull, along with main switch gear. Large surrounding windows with the front ones opening ensure good light but blinds or tarps outside will be needed on sunny occasions. The galley-down design creates a large entertaining space in the 1190’s saloon; while also giving the seamless access to the aft deck via the handy tri-folding doors (that cleverly seat in the roof). 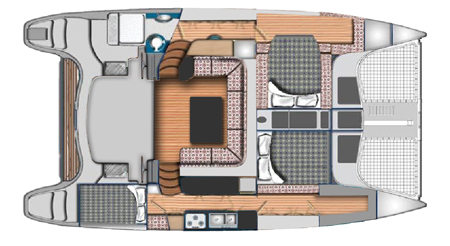 The 1190 Sport has three cabins plus a toilet in each hull. Our review model came with two double cabins forward in each hull plus a smaller one on the starboard aft quarter. The owner has most privacy in the port hull with double bed forward which lies athwartships while the navigation station adjoins this and the bathroom is aft. The elevated bed means limited headroom but it also gives good storage space beneath and in the forward bulkhead, while natural light comes from two opening skylights and rectangular portlights. In the corridor the navigation desk has a swing-out stool and locker. The desk is a spacious charting area with shelf above and bulkhead space for electronics – in addition to the instrument and power switches already there. 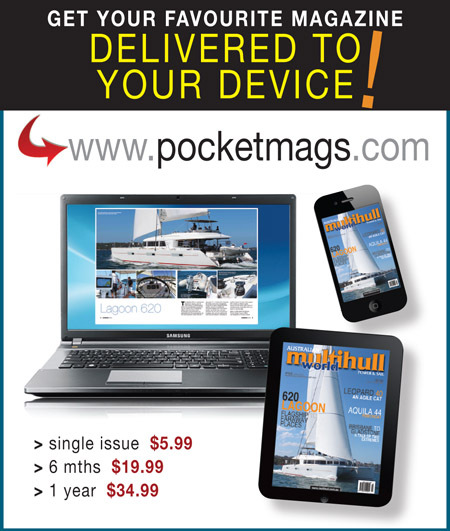 Unlike European boats that must comply to CE standards, there’s no escape hatches, but these could be a custom addition I feel; especially on a race boat that pushes its limits. Elsewhere, cabin doors are honeycombed composite yet felt strong without any flimsiness. The aft section of the port hull is taken up by the bathroom which has an electric head and separate shower cubicle – with easy clean mouldings throughout. Behind it, a door leads to the empty engine bay, as the outboards are inside bridgedeck wells. The removal of the diesel engines frees up a lot of storage space and as I noted while looking from the pontoon, lowers the waterline by several inches. The longitudinal galley dominates the mid section of the starboard hull and one window is blocked by the otherwise largely inconspicuous dagger casing. Utilities included Seawind’s signature double drawer fridge freezer that swings open beneath the composite worktops; and there’s locker space above as well. 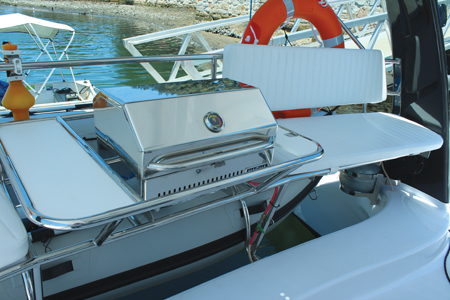 Outboard on each side of the daggerboards casing sits the twin sinks and three burner stove – with an option for an oven beneath. Having used this layout at sea and at anchor, I find it works well as it has enough room for two to cook while supporting you in a swell. Ventilation is good with a very large opening portlight and the open space above your head also gives airflow from the saloon. Elsewhere in the starboard hull is the double berth forward, located fore and aft. Again it has an opening skylight and of course hull portlights. Walking aft, through the galley takes me to the stern three-quarter bunk which is a pleasant spot, especially since the hot engines beneath have been removed. The large portlights, bench and cavernous storage locker underneath all go to make this a comfy single (or double at a push) berth. 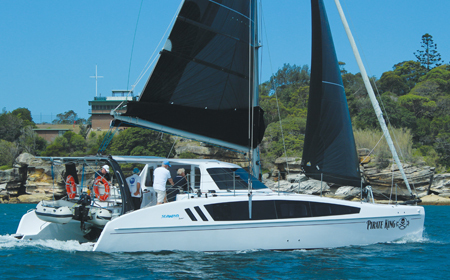 Manoeuvring in congested marinas is the bane of skippers but having engines on each corner gives catamarans advantages; allowing us to slowly clear the Rozelle marina. Underway, comfortably seated at the port helm I noted 7.8kts on the B&G plotter with the throttles of the Yamaha 25hp’s fully down. Lacking any engine dials, fuel consumption would have to be tested by owners. Clear of the Harbour Bridge we pointed into the wind to quickly hoist the mainsail using the electric Lewmar 25 winch, before unfurling and locking the self-tacking jib. Quick and easy; so easily done by a husband and wife team. Perched out on the gunwale I scanned our surrounds as I pushed the 1190 Sport onto the wind while my host for the day Brent locked the leeward carbon daggerboard down. This immediately pulled the hull upwind by a few degrees. Acceleration wasn’t startling in the 20kt breeze so I had to remind myself I wasn’t on a lightweight three ton racing cat from Alan Carwardine but nevertheless this fully kitted-out cruising cat sped along, attaining 8.2kts against a choppy sea; and tracking well with just a touch of weather helm on the drop-down carbon rudders. These are Carwardine models and effective; being deep and fairly balanced yet fully removable at the day’s end. Their effectiveness was most apparent when tacking and gybing; a huge difference in grip and speed compared to the Seawind 1160 Lite. For the home run we unfurled the screecher from the carbon bow sprit as I turned down to 120° apparent wind (with true at 18kts) which boosted the 1190 Sport’s speed to 11.2kts; and allowed her to earn her ‘sport’ moniker. 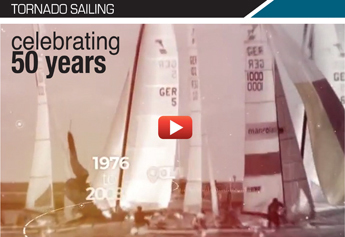 It’s a boat that definitely rewards experienced sailors, which is exactly how a sports version should be; so well done Seawind.